This summer, after 17 years of vocational ministry, I took my first sabbatical. It was a much needed and appreciated time of rest, prayer, reading, and fun with my family. We have been incredibly blessed to take this time away, and I am thankful to my church and my elders for granting me this sabbatical and handling the ministry of the church while I’ve been away. Since I am coming back to work next week, I’ve prepared a simple report on how I’ve approached this time. The purpose of this sabbatical was to get extended rest. Pastoral ministry isn’t just a career – it’s a calling. It’s the sort of calling that blurs the lines between “work life” and “personal life.” The biblical qualifications for pastors are mostly personal and related to character (1 Timothy 3, Titus 1, 1 Peter 5). In one sense, a distinction should be made between the work that elders do and the elders themselves who do the work. But this distinction is elusive. Elders are still elders even when they’re not at work. There’s the tangible work they do, such as preparing sermons, praying for the congregation, pastoral care, studying and teaching, and so forth. And there’s the intangible work, which the apostle Paul describes as “the daily pressure on me of my anxiety for all the churches” (2 Cor 11:28). That’s the sort of pressure that can’t easily be quantified. You don’t clock in and clock out from those pressures. The pressure is spiritual and eternal. You don’t go home after counseling a troubled marriage and stop caring about the couple. It weighs on your soul while your having dinner with your family. It sits in the back of your mind and invades your thoughts. It’s always there. For this reason, extended seasons of rest can be greatly rejuvenating for a pastor, because it provides a pressure relief valve for these daily anxieties. It is a time to trust God’s sovereignty and recognize that, at best, we are but weak men. Jesus will build his church. We are not the savior. For this sabbatical, I had four broad goals: (1) to deeply enjoy Christ for who he is apart from ministry work, (2) to enjoy my wife and children and have lots of fun memories together, (3) to disrupt my daily rhythms and normal habits, and (4) to focus of deep rest – mind, body, and soul – and return energized for the next season of ministry. The way I went about this was to unplug and leave town. I took trips alone (prayer retreat to a cabin), with my wife (to San Fransisco, Yosemite and Sequoia), and with my family. 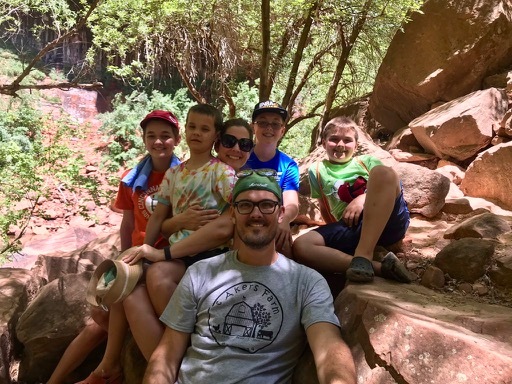 My kids wanted to do an RV Road Trip, so we rented an RV and spent two weeks out west exploring US National Parks (Zion, Bryce Canyon, Arches, and Grand Canyon). We visited some of the most beautifully breathtaking places I’d ever seen. Each place was so different, but they all stirred up the humbling pleasure of human smallness and the wonder of God’s creation. I also had a stack of books to work through, including “The Religious Affections” (my third time through it) by Jonathan Edwards, “Charity and its Fruits” by Jonathan Edwards, “How (Not) to be Secular” by James K. A. Smith, “The Shallows: What the Internet is Doing to our Brains” Nicholas Carr, “Boundaries” by Henry Cloud, “The Grace of Shame” by Tim Bayly, Joseph Bayly, and Jurgen von Hagen, “Gilead” by Marilynne Robinson, and “A Man Called Ove,” by Fredrik Backman. I focused much of my prayer time on spiritual health, emotional health, deeper friendships, and God’s leading for the next season of ministry. Now, as I prepare to come back to work, I am rested spiritually, mentally, and physically. I have prayed much, read much, and traveled much with my family. We have made great memories together that we will always cherish. Even though I have rested from the daily pressures of ministry, the work of the ministry has never been far from my mind. My prayer (and the prayer of my elders) has been that this would not be a vacation for it’s own sake, but a time of rest and renewal in Christ that will help sustain me for continued ministry. It is, after all, a calling, not just a career. Over the last few weeks, I have forced myself to watch every single one of the Center for Medical Progress videos exposing Planned Parenthood’s sale of fetal body parts to StemExpress. I was shocked by the cavalier conversations about “tissue” and “procurement.” The most recent video was the most horrifying of all: a fully intact male child, still clinging to his last moments of life on a metal dish, awaiting his final resting place in a bio-hazard bag. At this point, I’m sure many people will simply close this browser window and numb the pain of that mental image with a funny article at the theonion.com. But that says something about us. As much outrage that has registered over the past few weeks about this video, some might say that we should chill out for a moment. Dana Milbank of the Washington Post calls this “antiabortion extremism.” Some might be really bothered by all the outrage over Planned Parenthood and hope that the videos and the moral noise would turn down to a reasonable level. What bothers me, however, is the lack of outrage. Our society’s collective conscience has been seared, and these videos are, if we’re willing to watch them, forcing us to acknowledge that we are now living in Nazi Germany, 2015. Of course, that seems over the top. It’s easy to condemn the Nazis. The view from our moral perch in 2015 makes those crimes against humanity easy to see. You can tour Auschwitz and see for yourself. How is it that we can universally condemn the death camps of 1944, but not the death camps of 2015? How is it that a single politician can openly support and defend the practice of abortion and still get elected? How is it that an entire political party can make pro-abortion part of its platform? It’s because our collective consciences have been seared. A seared conscience lacks moral clarity. A seared conscience has been worn down through continued exposure to evil to no longer see it for what it is. Things that are undeniably right or wrong get buried with obscurantist language like “tissue” and “specimen.” Voters morally relativize when they support pro-choice candidates because “he’s good on economic policy” or “he cares about the poor.” Many Christians are eager to voice their concern for the poor and oppressed in 3rd world countries, but not eager to voice their concern for poor and oppressed unborn children. Many pastors love to talk social justice, but only about trendy causes. There is no greater or more pressing social justice issue in our country today than justice for the unborn. God’s heart in the Bible is continually concerned for four groups of people: the poor, the stranger, the widow, and the orphan. 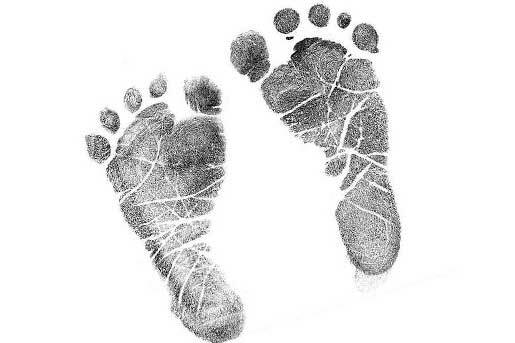 Is anyone poorer or more vulnerable than the unborn? Is anyone more of an orphan than the child of an unwanted pregnancy? You simply cannot support abortion and claim to be about social justice. This is the greatest social justice issue of our time. In so many ways, we have reached a cultural moment. The Center for Medical Progress has given us a personal tour of Auschwitz. But, unlike Auschwitz, this tour is not a “never forget” matter of history. It’s still happening, right under our noses. I live only six blocks from Cincinnati’s Planned Parenthood clinic. It’s happening in my own neighborhood. Many have not watched the videos yet. They’re painful and abhorrent. But we must know what’s going on. We don’t have to pay a fee or listen to a tour guide. Simply enter and pray for God to inform your conscience. I plan on participating in protest Planned Parenthood tomorrow. Details can be found here. To watch the videos and more information, go here. On July 19th, an old Cincinnati wound that has been slowing healing for the past 14 years was reopened when white University of Cincinnati campus police officer Ray Tensing shot and killed African American Samuel Dubose. Mr. Dubose was pulled over for not having OH state tags on the front of his car. Major news outlets from around the world have been covering this story (Cincinnati.com, MSNBC, BBC, Foxnews). Before the grand jury’s indictment was announced, the mood around town was tense. University classes were cancelled. Police were on high alert. Personally, this all hit home because the shooting occurred in my home neighborhood, Mt. Auburn. The church I planted 5 years ago is home to dozens of UC students who walk to church each week. On July 19th, while I was preaching a sermon about how Christians can faithfully navigate America’s cultural decline, Samuel Dubose was being shot in the head and killed less than a mile away. Earlier this month, I was proud to call Cincinnati my home when we hosted MLB’s All Star game and local legend Todd Frazier won the home run derby. It was electric. Downtown Cincinnati is vibrant and alive, with a gorgeous riverfront park that invites people from all over the region to sit on our city’s front porch. Just north of downtown, Over the Rhine is a neighborhood undergoing its own unbelievable renaissance, with millions of dollars of redevelopment being invested. This isn’t just hometown pride, others have taken notice, such as National Geographic. Even local Cincinnatians who have inherited her inferiority complex have asked forgiveness and fallen in love (language alert) all over again with our city. Yet our problems persist. Much of Cincinnati’s current success is due to a dark past of racism and injustice, even if so many of us are unaware of it. For better or worse, this is the city I love and have committed my life to. This is the neighborhood where my kids play. This is where my church is. But we’re sick of the caution tape. We’re sick of the teddy bear memorials on street corners. We see the best and worst of city life. 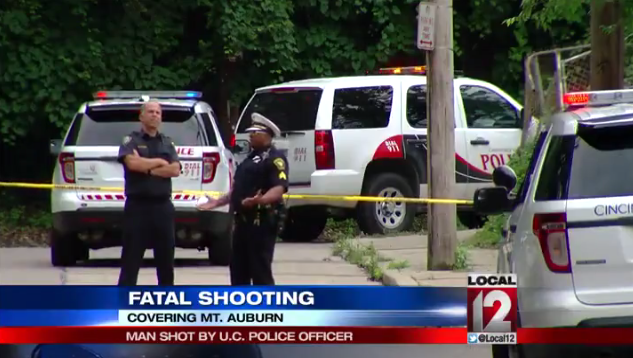 The Samuel Dubose shooting shows us that we’ve still got a long way to go. When a white person is pulled over by the police for a minor traffic violation, we think, “Oh crap. I might get a ticket.” But many African Americans don’t have the same experience. Some will tell you getting pulled over by police can be a terrifying experience. And now there’s video evidence (**graphic**) that proves the point. Samuel Dubose should be alive today. Prosecutor Joe Deters called this the most asinine police incident he’s ever witnessed. His outrage gave voice to countless African Americans who feel unfairly targeted and mistreated by police who haven’t had video evidence. The bible frequently pairs the words “righteousness” and “justice” (see Psalm 72 for example). Righteousness is the standard of what is truly good, rooted in God’s holy character and love. Justice is the community’s response to unrighteousness and injustice. As the church, Christians should pray for and promote God’s righteousness in our city, but also fight against injustice when we see it. In so doing, we are pointing people to the good and righteous King who ultimately provides both. Fighting for righteousness and justice shows us that God himself is the Ultimate Good. Proclaiming God’s righteousness exposes the sin in our world, our cities, and in our own hearts. Fighting for justice shows us that God is bringing all injustice to an ultimate end. That’s the hope of God’s Kingdom. Jesus is the righteous ruler who will bring God’s righteousness and justice to us. And Jesus’ kingdom was bought and paid for through the ultimate injustice, the cross. Jesus himself was an innocent man who was unfairly targeted by the authorities. Jesus was convicted of a crime he did not commit. Jesus was tortured and killed by people who hated him. There is no greater injustice than what happened at the cross. Yet in Jesus’ resurrection, we see that injustice never gets the last word. Life does. And having conquered the ultimate enemy, death, Jesus promised that all injustice will be made right and God’s righteousness will be absolute. That is the Christian hope. Until Christ returns, Christians bear witness to God’s Kingdom in every part of the world. We proclaim a righteous God, who took upon himself all the world’s injustices, and will make all things new in the end. Injustice never gets last word. One of the most important responsibilities for the Christian family is to pass on the faith to the children. But the thought of leading a family devotion sounds about as fun as a root canal. Schedules are busy, kids get antsy and hard to keep still, and activities pull the family in a hundred different directions. Is it even possible? I believe it is, and its not as hard as you might think. I have four kids. 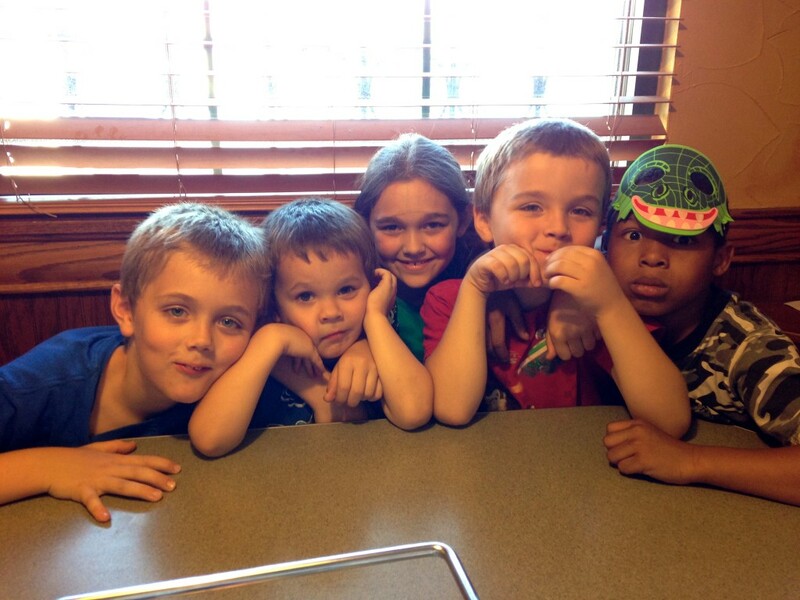 One girl (10 years old), and three boys (ages 8, 6, and 4). Life is chaotic and busy, and yet we’ve been able to find a weekly rhythm where we do a family devotion. It doesn’t need to take a lot of time, the parents don’t need to be theology experts, and the kids will enjoy it more than you may expect. I was first challenged to do family devotions while in seminary by my spiritual disciplines professor, Dr. Don Whitney. He suggested that every family devotion should have three main ingredients: singing, reading, and prayer. Simple. Wednesday night is family devotion night at the Clary house. The kids even look forward to it and make sure to remind me of it. For the singing part, I ask each kid to choose a worship song and then find it on YouTube with the lyrics (like this and this). My oldest son and I grab guitars and play along, but everyone sings along. We turn the volume up loud and have fun with it. Next, for the reading part, we choose one Bible verse or story and then talk about what it means. Sometimes I’ll ask one of the kids to read, sometimes my wife or I will read it if its longer or harder to read. This time is challenging and humbling because kids are always thinking and they have excellent questions. Even as a pastor, I often find myself without answers, and I’ll just tell them, “that’s a great question; I don’t know the answer.” That’s OK. We don’t have to have all the answers, we just need to provide a space where the kids can ask. Finally, we pray. Usually by this time, my four year old is losing his mind and can’t sit still any longer. The others are getting antsy, too, and that’s fine. We ask each child for something they want to ask God for and then we pray. Sometimes we give each child time to pray, and sometimes my wife or myself prays for everyone. What I’ve described above can take just a few minutes or could go much longer, depending on how many kids and what comes up. Honestly, sometimes I look forward to this and we have a great time together. But more often, it tests my patience as kids fight over songs and say unkind things to each other. And on occasion, by the time we’re finished I’m more frustrated than when we began. Trying to herd cats for 15 minutes can try anyone’s patience. It’s not magical, its often an exercise in discipline to just get through it. But as the kids grow older, the prayers, the songs we sing, and the scriptures we read give the Holy Spirit kindling to burn. It helps them to hear mom and dad confessing sin and thanking Jesus for his grace again for another week. It can be amazing or exhausting. Either way, we’ve invited God to our home and worshiped him together as a family. And in these few minutes we recognize that Jesus is King of Kings and Lord of the Living Room. I presented a simple Life Planning Tool in a previous post. 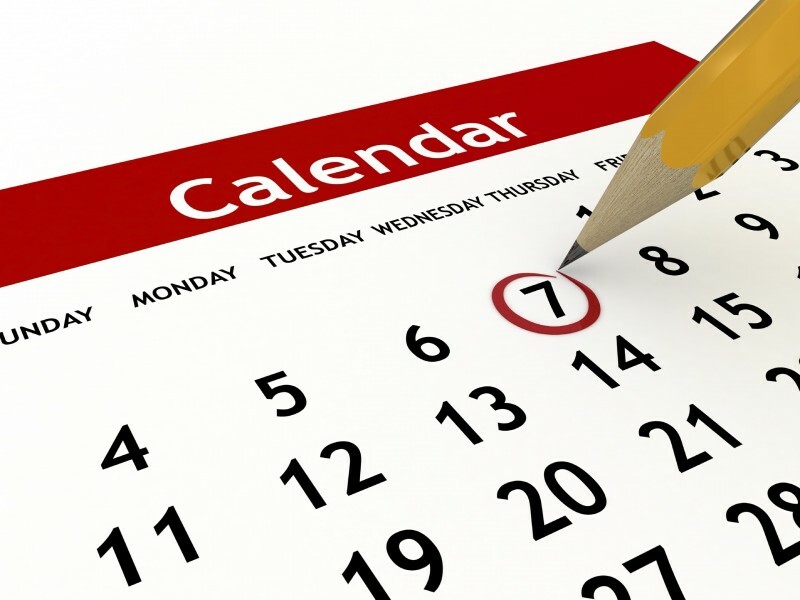 As the calendar turns over to another year, this is a great opportunity to evaluate your life’s priorities and make some changes. Many decide to read through the Bible starting in January, and there are plenty of tools to help you do this. For many people, the thought of reading through the Bible is daunting and seems like it would take forever. But it can be much more easily done by breaking it up into readable chunks and reading for a few minutes per day. 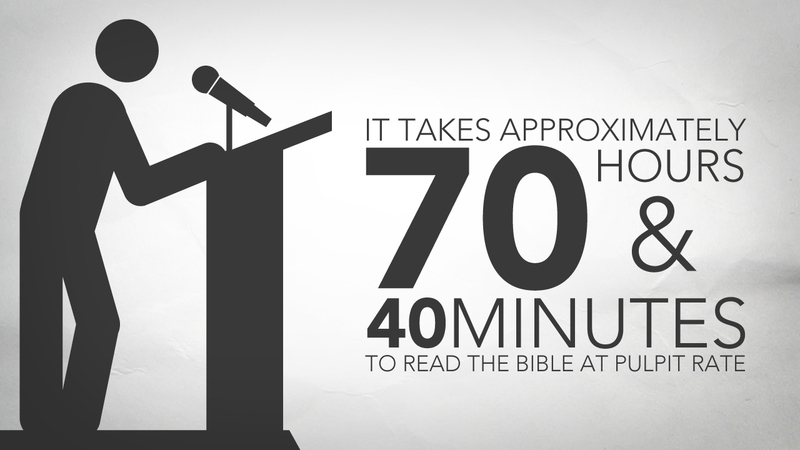 According to the graphic, it only takes about 70 hours and 40 minutes to read the Bible at “pulpit rate.” With a good plan, this can be done in a year. Here are my two favorite tools that I have used to help me keep track. 1. Discipleship Journal printable plans. If you’re old school and like to use paper and bookmarks, this is the way to go. Several plans are available here to print out. You can fold the paper up and use it as a bookmark and check the box for each chapter that you read. 2. Youversion Bible App. With this app you can choose from several Bible reading plans and the app keeps track of your progress. It also has the option to listen to audio recordings of deep-voiced dudes reading the Bible to you. Sadly, there’s no Morgan Freeman option. For me, I’ve decided that I’m going Amish with my Bible reading this year. I have found that using an app simply introduces too many distractions. When I sit down in the morning to read the Bible, holding an iPad in my hand tempts me to check sports scores, read blogs and news, and play a few words in Words With Friends before I ever open the Bible app. My focus this year will be reading from my ESV Study Bible and using a paper study plan that I’ll check off everyday. This will hopefully help me keep focused and on track in 2015. A couple of years ago, my friend Brian Howard shared with me a life planning tool to help me prioritize and set goals for my personal life. Businesses and churches have many resources to help people be more productive and focused on the job, but most of us live our personal lives on autopilot. It is no less important for us to know what to prioritize in our personal lives and have a plan of action than our professional lives. Over the last couple of years, this life planning tool has been very helpful for me to intentionally think through what are some of the most important things in my life and develop a plan of action for them. When I first used this tool a few years ago, I discovered an unexpected priority that I spent a year working on: patience. I prayed about this almost daily and saw God do some great things in my life regarding patience as a result. In 2014, I spent the latter half of the year focused on my personal health and wellness, lost 35 pounds, and am now in the best physical shape of my life. I have not yet completed a life plan for 2015, but as this year draws to a close, I will be thinking more about my life and what lies ahead. I’ve taken Brian Howard’s life planning tool and reworked it to better fit the way I think. My version of the Life Planning Tool is available here if you’d like to give it a try and implement for 2015. Pray the prayer covenant every day. If your personal life is in need of attention, the Life Planning Tool can help you think through your life, hear from the Holy Spirit, and make a plan for action. Have you seen this? The Democrats have had a stranglehold on black voters for years, which doesn’t make a lot of sense since the Entitlement state has done so much damage to black families and communities. This result was inevitable. In 2008, Democrats controlled the House, the Senate, and the Presidency, with the most liberal president in a generation, who also happened to be black. If there was ever an opportunity to showcase a liberal Utopian vision, this was it. Yet at the same time, the Bible repeatedly asserts that human beings have real authority over all creation (Gen 1:28), in marriage (Eph 5:22-24), in parenting (Eph 6:1-4), in government (Rom 13:1-8), over demonic spirits (Luke 10:20), and in the church (Heb 13:17). Exercising authority is exercising power, yet we are simultaneously called to a life of weakness. How can this be? Definitions are important, and in this case we need to understand what weakness means. Weakness is not the same as being passive, a push-over, timid, indecisive, ignorant, or unprepared. Many people fall into the trap of thinking that sitting around and doing nothing is what God wants them to do. This is not the weakness Jesus calls us to but rather putting God to the test. God calls his people to be people who exercise authority by taking bold and courageous action. We are simultaneously called to power and weakness. The weakness Christ calls us to is trusting God to work through our deficiencies. It is taking action with an utter dependence on God’s power to work through you. In other words, Jesus taught Paul that true effectiveness in ministry is not derived from human wisdom or human power, but rather on God’s wisdom and power (1 Cor 1:18-25). God reminded Paul of his utter dependence on Him by weakening him physically in some way (Paul called it a thorn in his flesh). Yet God still told Paul to continue preaching, studying, preparing, working, traveling, disciplining, and writing. Paul put forth maximum effort, but his ultimate trust was not in his own abilities, but a deeper trust in God’s power to work through him. I once knew a Christian missionary who decided that his fundraising strategy would be to sit in his room for a month and pray and trust God to provide. This sounds holy, spiritual and filled with faith, but it was his hyper-spiritualized way to avoid his fear of picking up the phone and putting in the hard work of support raising. Needless to say, he never reported to the mission field. For many Christians, this verse can become an excuse for sitting on the sidelines and not doing anything while holding the spiritual trump card of “trusting God.” That’s not God’s power through weakness, that’s just laziness. God’s power through weakness is trusting God through your fears, your doubts, your insecurities, your failures, and your ignorance — and yet still taking bold action, trusting that even though you’re weak God will do something for his glory through you. How will you trust God, in spite of your weaknesses, fears and failures, to still take bold action and believe Him to work through you? A few weeks ago at my church, I concluded a preaching series called Father Hunger. This series was about how God is the true Father and all Fatherhood is a reflection of his ultimate love and authority. The word for “discipline” here is important. It means much more than merely keeping kids in line through various disciplinary methods. The Greek word here is “paideia,” which does not have direct English counterpart. It is also translated “training” in the NIV and “nurture” in the KJV. To bring up a child in the paideia of the Lord is to instill in him or her a biblical worldview; not merely a few Bible stories, some rules, and some memory verses, but to help children see everything through a biblical understanding of things. The Bible presents us with a complete understanding of everything: our origins (Creation), what’s gone wrong with the world (Fall), what God has done to address sin in the world (Redemption), and where all this is headed (Judgement/New Creation). God’s purposes are integral to everything and it is important for Christians to see everything through the lens of God’s work in the world. So, then, where do we begin? The starting point is the gospel of Jesus Christ, where we all see that salvation is a matter of God’s gracious work to transform us by the cross and not our moral effort. But certainly, the gospel does not exclude morality, the gospel empowers morality. Within the framework of God’s saving work in the hearts of children, they also learn God’s character and how to live life through good training on Christian morality. The first seven chapters of Proverbs is like an instruction manual for parents, showing the various topics of discussion and instruction that parents can instill in their children. These chapters ring continually with this and similar refrains, “hear, my son, your father’s instruction, and forsake not your mother’s teaching (1:8).” Several times through these chapters, the phrase “my son” appears and introduces a new topic. I’ve made a list of the various topics from these verses to get a sense for the sort of instruction that is needed to give children a biblical worldview. This is not a comprehensive list of everything to teach children, but can give parents direction in where to begin. Honor father and mother by listening to and obeying their counsel (1:8). Have good friendships who will be a good influence (1:10). Get along with others and avoid violence (1:11). Do not resist discipline but learn from it (3:11-12). Show justice and fairness to others (3:27). Always tell the truth (3:28). Keep your focus on what’s most important (4:25). Settle financial disputes quickly before they turn ugly (6:1-5). Work hard to provide for yourself and your family (6:6-11). Don’t listen to a seductive woman (5:3). Don’t put yourself in situations where you’ll be tempted towards sexual immorality (5:8). The consequences of sin are painful and long lasting (5:9-14). Find sexual fulfillment (and lots of it!) in your wife (5:15-19). Don’t entertain sexual fantasies and lust (6:24-35). Guard yourself against all forms of temptation (7:1-21). Sexual sin is extremely destructive (7:21-23). A good practice for parents would be to read through Proverbs 1-7 over and over and allow these verses to help instill a biblical worldview in your own heart so you can pass them down to your children. 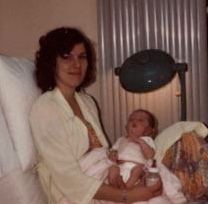 That means, 40 years ago I was doing this. I’m the one in the diaper. My 30’s have evaporated in a fog and now they’re gone. I remember being a kid and having my parents’ friends over at my house for someone’s 40th birthday party. Black balloons. Over-the-hill hats. “That seems like a lifetime away,” I thought to myself. No, only about 30 years away, as it turns out. As I saw this day approaching, like watching a ominous clouds hovering in a dark sky, I thought I’d be curled up into a ball and spending the day binging on junk food, watching Meryl Streep movies, and crying myself to sleep. So far, that hasn’t happened, but I did enjoy watching Bill and Ted’s Excellent Adventure on Netflix yesterday. Strangely, I feel great. Better than I would have thought I would feel, now that I’ve been breathing air for four decades. I do still have bouts of depression from time to time, but God has blessed me immeasurably. My wife, Laura, and I have been married for 15 years. 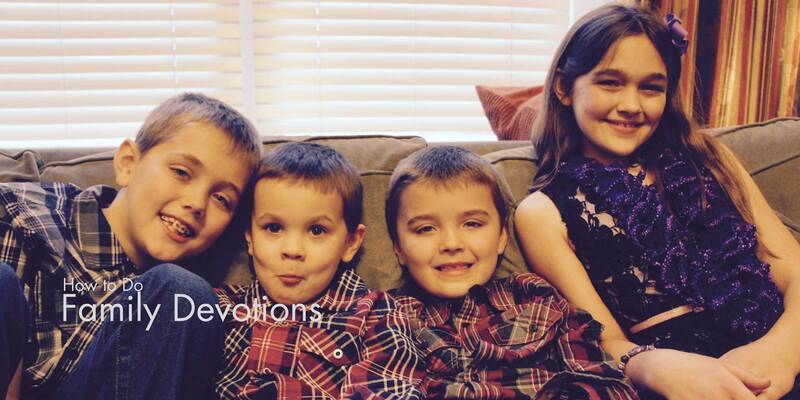 We have four beautiful children together, and I love being the lead pastor of Christ the King Church. There’s much to be thankful for. I suppose each decade of my life has a theme. I spent my 20’s trying to figure out who I was and the sort of person I wanted to be. I worked at a bunch of different jobs, clawed my way out of debt, married up to the most amazing woman, and decided to go into ministry. In my 30’s I settled into a few distinct roles and focused on them. I became a father for the first time at age 30. 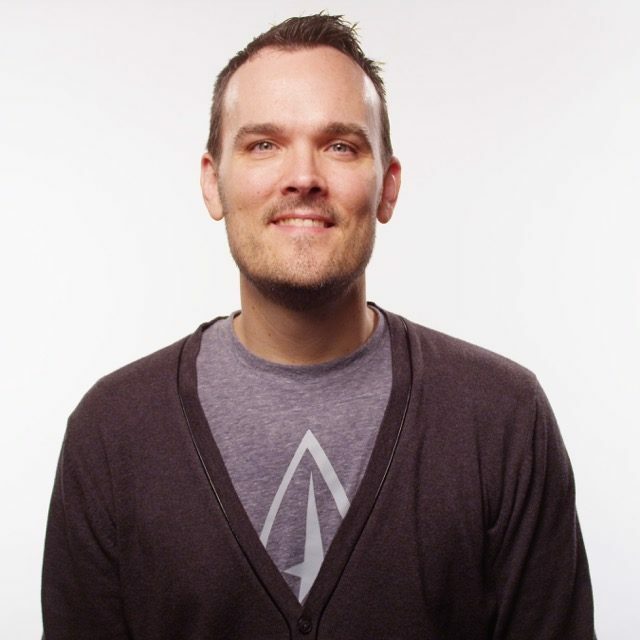 I went to seminary, worked in college ministry, helped plant Fellowship Church in Louisville, and moved to Cincinnati at the age of 34 to start Christ the King Church. I’ve now settled into the work that I expect I’ll spend the rest of my life doing: being a missionary to Cincinnati by planting more churches in this city. If there’s a particular theme I’d like to have for my 40’s, I’d take it from Micah 6:8: “do justice, and to love kindness, and to walk humbly with [my] God.” I want to focus on the things that are most important, not necessarily the things that are most urgent. And I want to live it with all my might. I want to enjoy the people and the work God has given me and serve Him faithfully until the end. I don’t feel old. But old is coming whether I want it to or not. So I want to make every day count. I can’t help being pensive around such a milestone. Four decades of life on this earth. Blessings too numerous to count. I’m thankful to God, my wife, my children, the rest of my family, and my church for all the ways my life has been enriched by all of you. I am truly and deeply blessed.